Setting a budget leaves many entrepreneurs asking the question, “Does my small business need a bookkeeper?” It might feel like taking on an expense for bookkeeping is unnecessary, but there are definitely advantages to hiring a professional to keep your books organized and well maintained. Before you automatically decide that you can do your own bookkeeping, you should learn about the benefits and assess your options. Read on, and decide for yourself if hiring a professional is really in the best interests of your small company. Do You Have the Time to Do Bookkeeping Task on Your Own? It is easy to take on the common DIY mentality when you are operating and building a small business. Anything that you can do to save money sounds enticing, but you must remember that the time that you spend on other tasks takes away from the time that you have to spend servicing your clients or coming up with growth strategies. You must consider your worth and how much time you will spend daily on bookkeeping. Instead of doing all of the hands-on tasks that go along with managing your own books, when you hire a bookkeeper, you will have a professional to do these tasks for you for an hourly rate. This leaves you time to work on tasks that lead to profits. A bookkeeper’s role can be involved. If you have a smaller business with very few employees, the bookkeeper may not spend as much time as a professional of a mid-sixed company doing paperwork filings and cutting payroll. The bookkeeper can draft invoices, pay bills, record expenses, track money, file taxes, consolidate bank statements, reconcile accounts and more. The bookkeeper will organize the financial information and records in order to help you sort it out quickly. At a glance, you will be able to see where money is going and how expenditures are stacking up against your running budget. 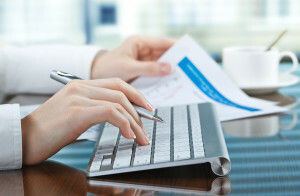 When is Hiring a Bookkeeper the Right Choice? If you want to improve your chances of succeeding as a small business owner, you need to have knowledge and the ability to be a strategic thinker. When you do not hire a bookkeeper, you are not giving yourself the information that you need or the time you need to focus on strategy. Spending your money wisely is crucial and the money spent on a bookkeeper is worth it when you have someone who is dedicated to record keeping, according to Entrepreneur. As an entrepreneur, it is natural to be so busy that you have no time to focus on records and where the money is going. For a minimal monthly cost, you will be able to see the trends on paper so that you are prepared to handle issues before they become serious. If you only have a handful of employees, you will probably only need a bookkeeper for a few hours each week. An experienced bookkeeper is only going to cost you between $30 and $40 per hour on a contract basis. Some firms have minimum monthly charges that range between $100 and $150. You will need to research options and decide if hiring a part-time professional or a service provider is better for you. The answer to the question “Does my small business need a bookkeeper?” is most likely a yes.